The brand new 3D version of the classic Cave Story is coming to Australian Nintendo 3DSes some time this year. With the games sordid history of release here in Australia, its good to see Namco Bandai Australia take up the publishing duties of the title. 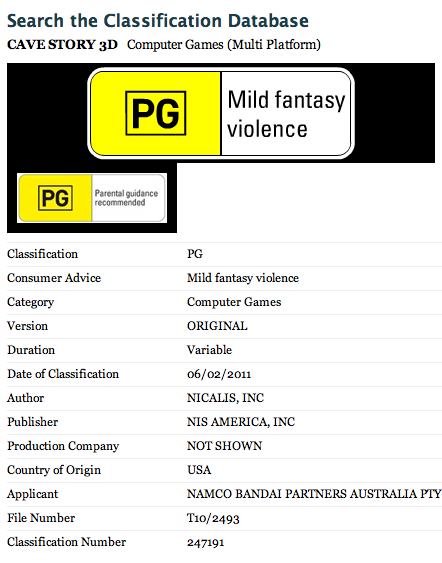 Namco Bandai is yet to confirm a release date yet – were only aware of this news thanks to the Australian Classification Board. Cave Story 3D is a complete remake of 2004’s Cave Story. The makeover sees new character designs, new weapon models and updated environments to take full advantage of the 3DS’s stereoscopic visuals, while staying true to the side-scrolling style of the original game.